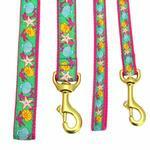 Our Reef Dog Leash will have you and your pup thinking of sea and sun! 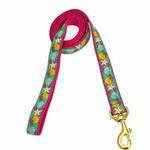 This Reef Ribbon Dog Leash from Up Country has a beautiful pattern that's just right for your pup! This leash is made from high-tensile strength nylon webbing with sewn on polyester/nylon ribbon. This leash is also stain and fray resistant and designed to last! The hardware is a cast solid brass swivel clasp. Machine washable and made in the USA! Reef Dog Leash by Up Country Customer Photos - Send us your photo! 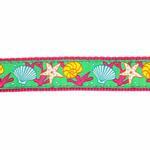 Molly loves this design for her new Reef Dog Leash and Collar! Posted On 02/26/16 by DAVID O from Chicago, IL Yes, DAVID O recommends this product! This leash really complements the harness I bought my little girl Meisha, and she has already gotten complements on it! Posted On 06/03/15 by Katherine from Boca Raton, FL Yes, Katherine recommends this product! Love this design! It looks so nice with the matching collar! Just waiting for the matching harness to become available!